Most of us are familiar with the “Golden Rule” when making espresso — 3/4 to 1 ounce of espresso in 25-30 seconds, or roughly double that volume for a double shot. When pulling a shot of espresso, how concerned should you be with the timing? How concerned should you be with the flow? Obviously a combination of both must factor into play, but without going into the myriad permutations you can have of this or that, you come down to the main questions..
Too fast or too slow, which is worse? There is always an ideal range you want to fall in, but between the two, you would rather have a thirty-five second or greater pour than a sub twenty second pour. This is because espresso, in layman’s terms, is about extracting the optimum amount of flavorful oils from the grounds. But how do we determine if this has happened? I use timing as a ‘rule of thumb’ guide and then primarily watch flow and inspect the portafilter to see if it is clean. If the portafilter is clean, and the timing fell in the optimal range, we can assume that the oils were extracted perfectly, and made it into the demitasse. If there are dark oil stains on the inside of the portafilter, this is usually an indication of overextraction… or poor distribution, but that’s a topic for another time. If we underextract, as many places do, and get that eleven second pour, there are virtually no flavorful oils being extracted, and unflavorful piss-like espresso will usually be the result. I can opt for intense at times, but unflavorful, weak espresso is a far worse crime. How important is the flow? 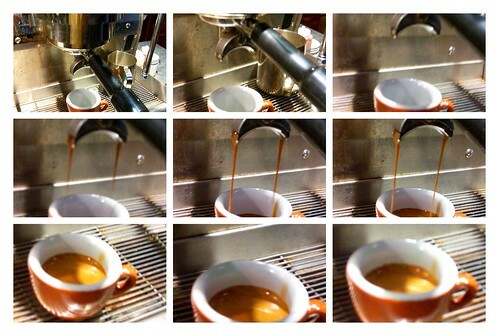 Flow is important because it gives one a good indication of the color and density of the crema. While the existence of crema is not the end all be all of espresso, it is most certainly one of the most important factors. Crema is important because of all of the body, texture, flavor, and aroma it gives to the espresso. It’s never a simple process, but evaluating espresso by taste is the ultimate way to judge, so whether there are dark oil stains in the portafilter or it was a thirty-eight second pour, we have to use our palate as the ultimate judge. Of course, in my opinion, a great tasting espresso with indicators that it is somehow flawed can only mean there is more improvement ahead. While this is not intended to be anywhere near a deep exploration of the subject, I hope it will at least get your brain churning.